So it looks like the beautiful UAE winter is coming to an end, and the scorching heat of summer awaits on our doorsteps. We, however, won’t be too bothered because our air conditioners make our indoor climates comfortable and pleasant. But that’s the problem. Most of us take our air conditioners for granted. It’s one of those necessities that when it’s working nice and perfectly, we don’t take notice. But once our air conditioners fail us, we would be willing to sacrifice our next of kin just to get them working again as tearing off our skin and sitting in our bones isn’t quite the most rationale way to keep things cool when our air conditioner breaks down. As the saying goes, an ounce of prevention is worth a pound of cure. As you should know (or you’re in complete denial), there’s a few steps you can take right before the advent of summer to prevent your air conditioner conking out on you in the worst of times. Take heed though, there are more than a few types of air conditioners; the below tips are relevant to most air conditioners in general – any tips specific to an air conditioner type will be mentioned. This may seem obvious, but most of us ignore the simple matter of regular maintenance for our air conditioners. Your air conditioner is an intricately built piece of machinery, and everything has to work in perfect harmony to create that cooling breeze. Over time, your unit may develop small, sometime unnoticeable, problems that result in your air conditioner working harder to cool your home. It would be best to hire someone to do the job for you (*hint* *hint*) to inspect, clean, and tune-up your air conditioner. This will expose any problems that you probably didn’t know existed and have them dealt with before they become serious issues. One of the most common AC problems is a clogged air filter. For split unit air conditioners, you can easily clean your filters by removing them and washing them down with water and leaving them out to dry. It’s very easy to do and requires little effort; this should be done at least once a month and right before the summer. For central air conditioning systems, your filter should be changed regularly (check your unit’s manual). There’s more than one reason to change or clean your filters; the obvious one is that it restricts the flow of air through the system. Uncleaned filters also harbor dust, pet hair, mites, dirt, and other indoor pollutants that may trigger allergies for you, your family, and your guests. Ductwork is hidden within ceilings and walls; therefore, a full cleaning of your ducts should be done by a third-party professional (another *hint*). You can do some work yourself by wiping away the exposed part of your ducts. Pay attention to any wear and tear or damage on these ducts too. Because your air conditioner blows cold air into a warm room, condensation will form on the ducts and build up over time. This is an ideal environment for fungus and mold to grow. So make sure that you, or a professional, take care of this potential health threat regularly. Split-unit air conditioning systems will have pipes to carry away the condensation. Make sure there is no dirt or anything else blocking these pipes. The climate in the UAE makes this problem more common than you may think. In your split-unit system, the air conditioner coils are where everything happens. The coils are on your condenser that is located outside your home – these must be cleaned regularly. Not only will this make your AC run better, but the air conditioner will also use less energy, translating to electric bill savings, to cool the air if the coils are kept perfectly clean. 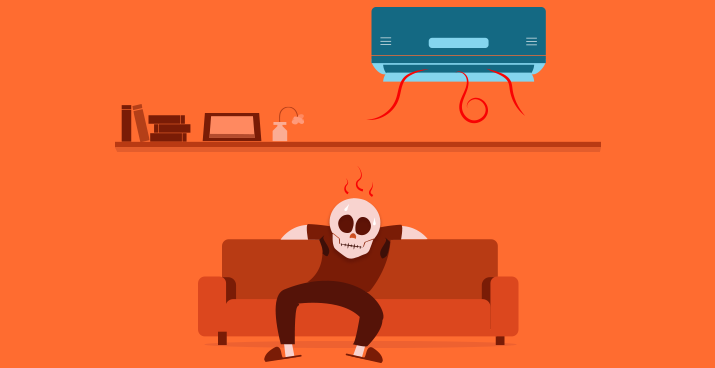 Whether your air conditioner quits working in the sizzling UAE summer, or you home after a few weeks leave to find your apartment hotter than the mid-noon sun, just know that air conditioner breakdowns are very much avoidable. Just follow the tips above and your AC should be in tip-top shape for the summer and beyond. And of course, if you are looking for AC repair and maintenance services, as always, we have the Usta for you.